The easiest way to tap into your ATV’s hidden performance potential is by adding an aftermarket exhaust system. Over the past decade, the design of four stroke exhausts hasn’t changed much. Meanwhile, sound restrictions have become more stringent on public lands; even some racing organizations are starting to enforce decibel restrictions. Last year, HMF introduced their Competition Series exhaust system, taking a step forward in both design and functionality as well as being available in both full system or slip-on models. The Competition Series’ systems are constructed of stainless steel with a T6061 aluminum silencer body and polished aluminum end cap. The Competition Series is currently available exclusively in HMF’s new, signature black, powder-coated, silencer body with blue and white graphic. What makes this system special is HMF’s Trimax Core. The exhaust comes with three different inserts that allow you to dial in three different levels of sound and three different levels of power. The inserts are said to limit decibel levels from low to mid 90’s, mid to upper 90’s, and upper 90’s to lower 100’s. Larger inserts provide more power, while the smaller ones produce less noise. You can simply swap from one insert to another to go from the track to the trail, and, of course, a removable spark arrestor comes standard. HMF’s Fuel Optimizer or similar fuel management system is necessary to make your Fuel Injected ATV run properly with an aftermarket exhaust. We liked the rideability of our Kawasaki KFX450R test unit’s engine, but wanted to turn up the volume a bit on its power output. HMF claims their Competition Series was designed to, ”…distribute power evenly throughout the RPM range” –– exactly what we wanted for the KFX. 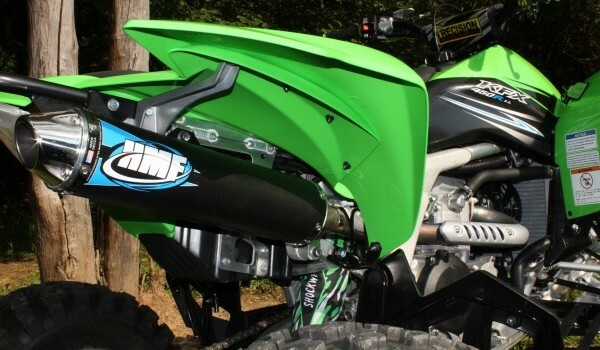 Since the KFX comes from the factory with a trick titanium head pipe, we decided to run the slip-on Competition system and spend the difference on HMF’s Fuel Optimizer, which is necessary to make your KFX run properly with an aftermarket exhaust. The exhaust’s fitment was precise and the optimizers included instructions, which made installation and tuning straight forward. The Optimizer comes pre-programmed with a map for the HMF exhaust and the airbus lid removed. 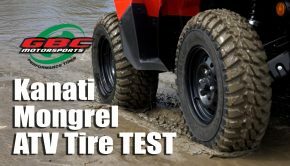 We found HMF’s baseline settings on the Optimizer to be close; however, they seemed a bit lean on the bottom end, resulting in a few flare outs when we chopped the throttle at slow speeds. We increased the fuel in the air/ fuel mixture from 1.5 to 3.5 on the Optimizer’s Mode 1 settings, which controls from idle to ¼ throttle. This seemed to cure the flare-out issue, plus the engine ran smoother at idle and started much easier when hot. If you need help figuring out how to tune your Optimizer, HMF has an easy-to-follow, how- to video on YouTube. The Competition Series exhaust comes with three different inserts that allow you to dial in three different levels of sound and three different levels of power. We tried all three inserts in our exhaust to check out the difference in sound and power. The Stage 1 insert wasn’t much louder than the stock exhaust, making it ideal for public lands or private property with neighbors near by. At its quietest, the combo of the exhaust, removed air box lid, and optimizer produced a notable increase in performance compared to stock. As we installed each of the inserts, the power output increased with the decibels. HMF warns that you may need to rejet or change your fuel map settings when switching inserts. The stock fuel controller settings seemed better suited for the quietest insert. With the Stage 2 insert installed, we had to hit our test track’s step-up jump in second gear. With the Stage 3 insert installed, our KFX pulled third. After testing the capabilities of the various inserts, we spent the remainder of our day riding with the Stage 3 insert installed, taking advantage of the maximum available power. 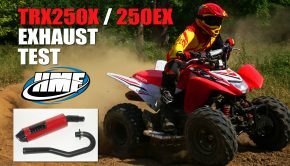 With the HMF Competition Series exhaust and Fuel Optimizer installed, the overall power of the machine was very similar to stock with more power available everywhere. With the HMF Competition Series exhaust and Fuel Optimizer installed, the overall power of the machine was very similar to stock with more power available in the bottom end and midrange. The top end power was also notably improved upon; however, the Kawasaki’s restrictive intake system prevents you from taking full use of the exhaust’s performance capabilities. Even so, the performance gains were undeniable making the KFX’s engine faster and more effective. 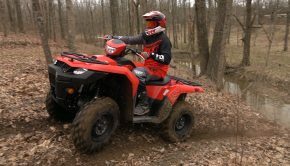 Many exhausts can increase the performance of your ATV. What sells us on the HMF Competition Series is its flexibility. Being able to significantly decrease the sound of our ATV when necessary without having to take the time to reinstall the heavy stock exhaust is great! It may say Competition Series on the box, but we think it’s a good exhaust for anyone concerned about making power and controlling sound output.